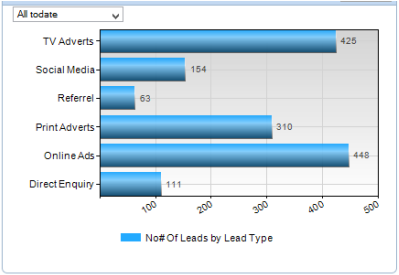 Have you ever had to visualise KPI data for a client or upper management? In many ways, this is a lot harder than doing it for your own use, as you need to tailor your approach to someone else’s preferences. In my experience consulting, I have seen many people try to impress clients with eye catching visuals in their dashboards. The problem is that the charts which turn heads aren’t usually the most useful. I’ve written this article to enlighten you on 4 emerging, eye-catching visualisation examples, and how you can use some simpler alternatives to make your KPI dashboards more effective. After reading this article, you’ll be able to impress your clients, and for the right reasons! Chances are you’ll have seen bubble charts recently. These charts are used for comparing, and emphasising, values of categorical data. Take a look at the chart above. 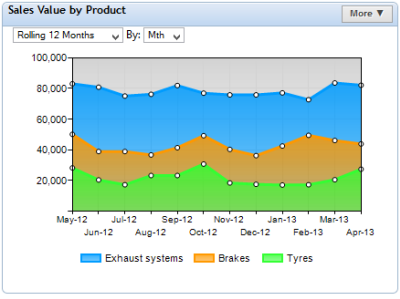 You’ll see that using bubble charts let you compare a lot of individual values in one place. 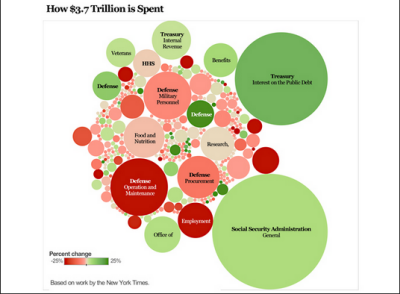 Also, the cluttered bubbles actually add to the charts perceived usefulness. The problem with the bubble chart becomes apparent when you use the size of the circles for direct comparison ; the circles are practically meaningless without descriptions, and do not accurately show the changes in values. Using the categorical column chart , you can show the same kind of data presented in the bubble chart, but in a way that users can directly compare values using the chart itself. It is extremely hard for us to compare changes in area accurately (Few, 2012, Show me the Numbers), so we’ll naturally rely on the written values instead. With the bar chart, we can visually see the differences in values, allowing users to take in the information quickly, for more efficient decision making. The last time I saw this type of chart was in my morning newspaper. This only goes to show the primary theme of the unit chart: Visual impact. Many news stories require data to be supplied as evidence , presented in a way which captures interest. 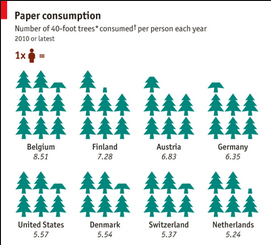 However, while the above unit chart certainly draws attention to the sheer volume of trees being cut down in Europe, it doesn’t allow us to make decisions quickly from the chart alone. Like the previous bubble chart, we can only perceive the overall difference in size from the graphics, not accurate value changes. 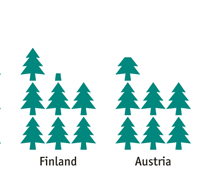 Let’s compare the graphics for Finland and Australia. You can see that it’s incredibly difficult to tell the exact value. While this chart is great for showing its point, it is not useful for data that has to able to be analysed and understood quickly and accurately. 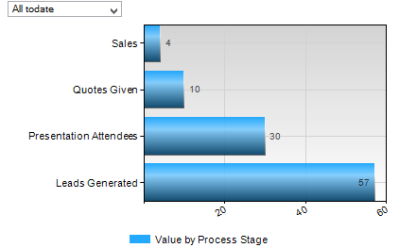 The horizontal bar chart lets you compare values through graphics alone. This is crucial to making quick decisions, as if the graphics cannot clearly communicate value information, users will rely on the numerical values on the chart instead, so it’s no better than reading a table. With a horizontal bar chart, the numerical information on the chart compliments the chart, and the graphics are easily readable. This makes it one of the best visualisation examples for displaying categorical KPI information. This type of chart attempts to show an overall ‘total’ value of a time-based metric, broken down into different categories. While this sounds great on paper – breaking down important data into detailed components is very useful for decision making – the problem with this chart is one that has been repeated through this post: accurately comparing the values of each time period is difficult. 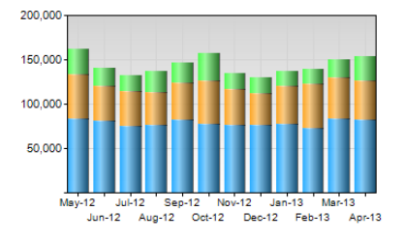 While the above chart is a stacked area chart, the same problem can be seen in stacked bar chart. Because the trend information is emphasized in the example data, I have chosen the king of directional charts, line charts, as the solution.Stephen Few, a renowned expert on data visualisation, also suggests using a second line chart for the total value. This is particularly useful if you&apos;re wanting to implement sales management using a KPI dashboard as you can manage multiple products or reps from the same chart, then view overall sales to get both broad and detailed perspectives. In this case, two charts are clearly better than one! 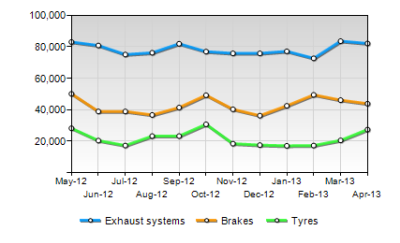 The first chart is used to accurately show trend and value comparisons for individual categories, whereas the trend data for the total KPI can be viewed without obstruction and clutter in the second. 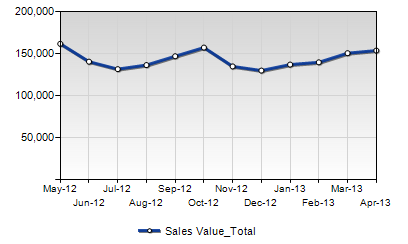 You can always do the same with column charts to easily compare values! 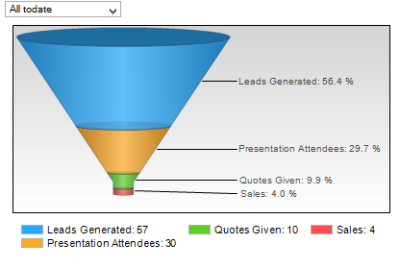 Funnel charts were designed to show the various stages of a business process (here, we’re showing sales), particularly the number of individuals who remain in each stage. I might be sounding like a broken record here, but this chart also relies on numerical values to base decisions on. If you try to compare the blue and orange parts of the funnel chart above, you’ll see that it’s very difficult for our eyes to perceive the exact size differences. Instead, context is given by the numbers at the side of the chart, which is where our eyes are drawn to. This makes the chart very inefficient; we might as well be reading a table. Although they look nothing alike, funnel charts are fundamentally similar to the bubble chart, in that they rely on comparing the area of shapes. 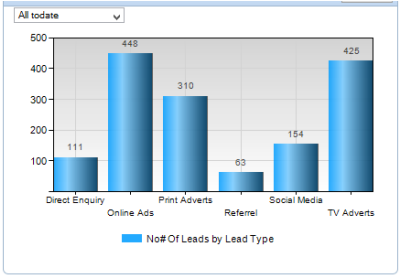 Therefore, a bar chart is also an effective alternative to the funnel chart. Here is the same data in bar form. By comparing this chart to established targets, we can easily make decisions for both value comparisons and the effectiveness of the funnelling procedure in gaining sales. The simplest charts are often the most effective! There are many weird and wonderful charts out there which are guaranteed to impress your clients… for about 5 minutes, before they realise that they can’t make effective business decisions quickly. This article has shown you how to avoid the mistake of including charts solely for visual impact. Instead, I’ve suggested four simple alternatives to popular charts. Though bar and line charts are very simple, they have proven to be the most effective charts for comparing values, and making the best business decisions. Though this article has shown you how to make the most useful KPI dashboards, you can find more data visualization examples in our visual dashboard database. 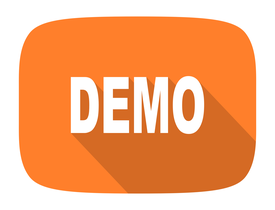 Or better yet, watch a free demo with Target Dashboard and find out how easy it is!